Since I was a kid, I’ve always thought that Remembrance Day was an important day. And never more so than when I was a teacher at John McCrae Secondary School, named for the Canadian doctor who wrote the iconic poem “In Flanders Fields.” As one former student said, “At John McCrae, Remembrance Day is a big deal.” Every November, my colleagues and I worked with senior students to create a moving ceremony which taught the younger kids the value of “remembering.” The students painted murals, researched and wrote scripts and creative fiction, played and sang songs, and created slide shows to try to recreate the lives of men and women who went to war. As November 11 approaches, I know the staff and students at my old school will be working feverishly to be ready. But instead of focusing on the events at home this week, I’m thinking of a very different ceremony, one that my husband and I attended in 2008. We were on a three month trip to New Zealand, and Australia. It was our second trip “down under,” and we were determined to see some of the out of the way places we didn’t have time to see on the first trip. If you look at the map below you can see some of our journey. 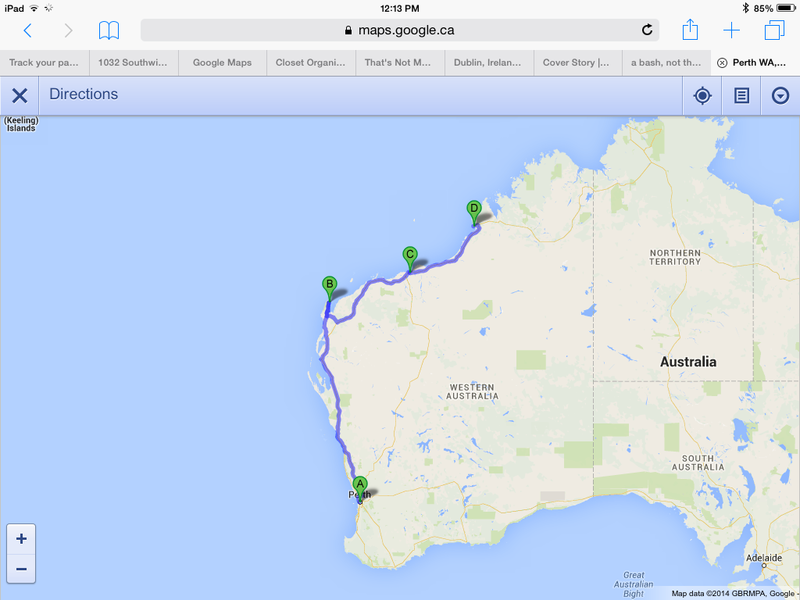 On this leg of the trip, we drove up the west coast of Australia from Perth (A), detoured a bit and spent a few days in Exmouth (B). 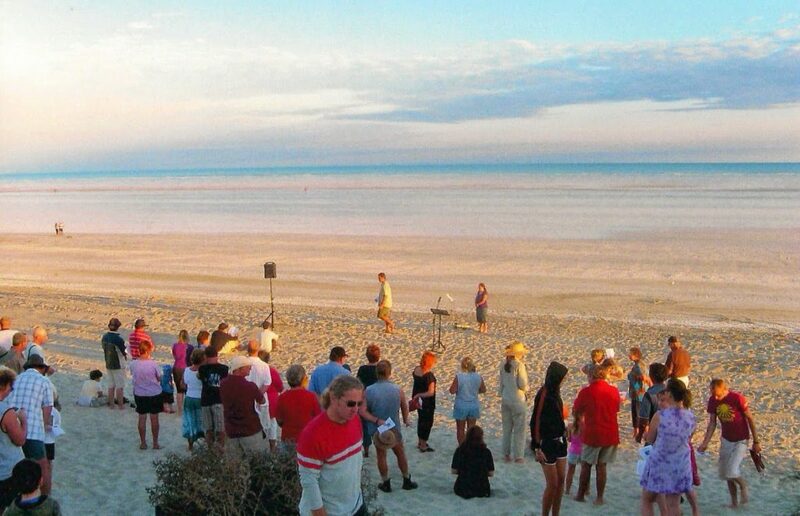 Then we stopped for the night at the caravan park at Eighty Mile Beach (C). Our odometer would say 2400 km and counting when we left for Broome (D) the next day. We drove the 10 km dirt road between the highway and the caravan park at Eighty Mile Beach with some trepidation; it didn’t get much more out of the way than this. 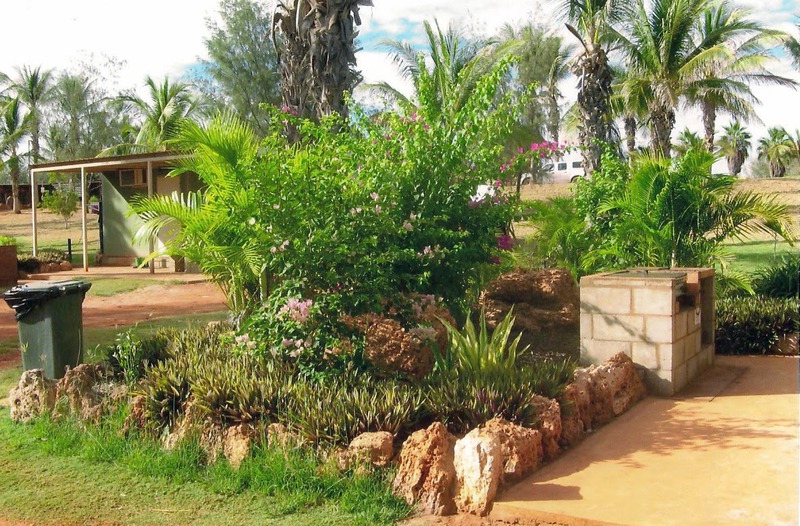 But as it happened we were booked into a comfortable, air conditioned cabin surrounded by beautiful gardens and flowers, with our own patio and barbecue. As darkness fell, we sat outside with our wine, waiting for our dinner to cook, and star gazed. Then through the darkness we saw two people with a flashlight approach. A friendly Anglican pastor and his wife had come to invite us to a service the next morning. At dawn. On the beach. 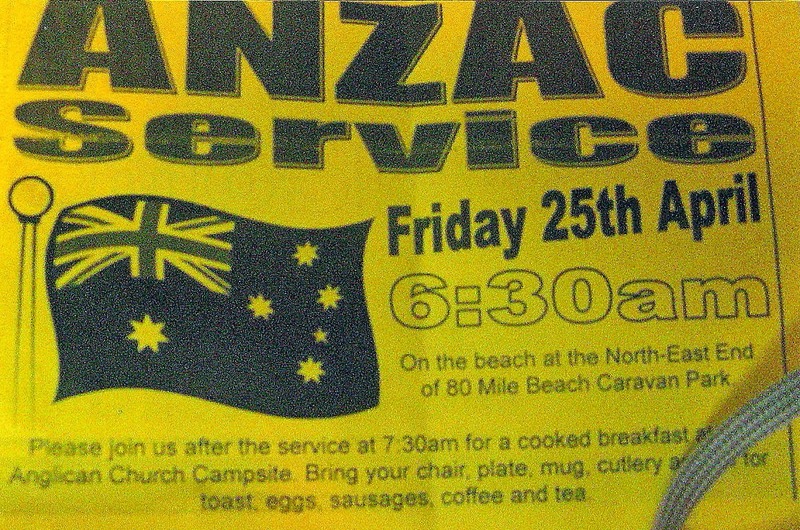 They had, in fact, invited us to their Anzac Day service. “Anzac” stands for “Australian and New Zealand Army Corps” and Anzac Day marks the beginning of the devastating battle of Gallipoli in the First World War. April 25, 1915. Gallipoli is to Australians, and New Zealanders, what Vimy Ridge is to Canadians. Not just a battle, but a moment in history which helped a young country to define itself. So along with seventy or eighty strangers in that out of the way place, far from home, we gathered… at dawn… on the beach. It seemed a fitting way to mark the landing, so many years before, of all those young soldiers… at dawn, on a beach… far from their home. The song spoke of old men who had once been soldiers: “And the band played Waltzing Matilda/ And the old men still answer the call/ But year after year, their numbers get fewer/ Some day, no one will march there at all.” Tears running down my face, I thought of my stepfather who had fought in Italy in World War II. 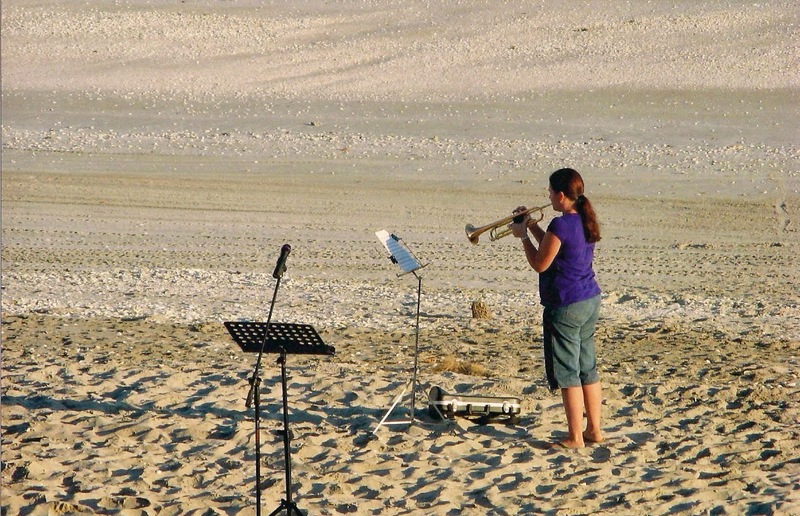 Then a young musician, wearing flip flops, stood in the sand and played Taps and then, after a moment of silence, Reveille. After the ceremony, we went back to our cabin to collect plates and cups and cutlery for the breakfast. Then we hitched a ride with these kindly folks back to the picnic area. I’d ridden in the back of trucks before…but never one quite like this. I carefully tucked the program for the service into my pocket to bring home for my stepfather. I thought of how I’d tell him of that morning’s ceremony when we got home, and how interested he would be. But we never did have that conversation. 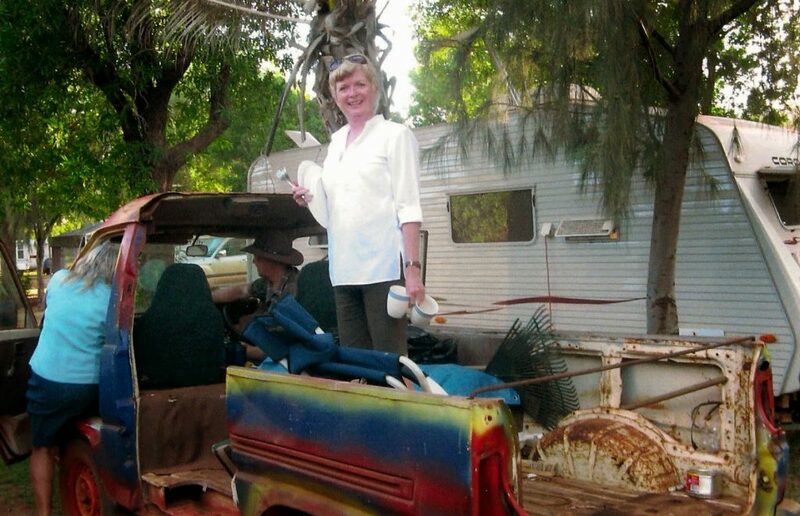 The next day, when we were on the road to Broome, he suffered a massive stroke and died that evening. Three days later, having just flown into Cape Leveque, 220 km north of Broome, on a tiny 4-seater plane, we heard the news. We turned around and headed for home. This is a shot from the 1970’s. 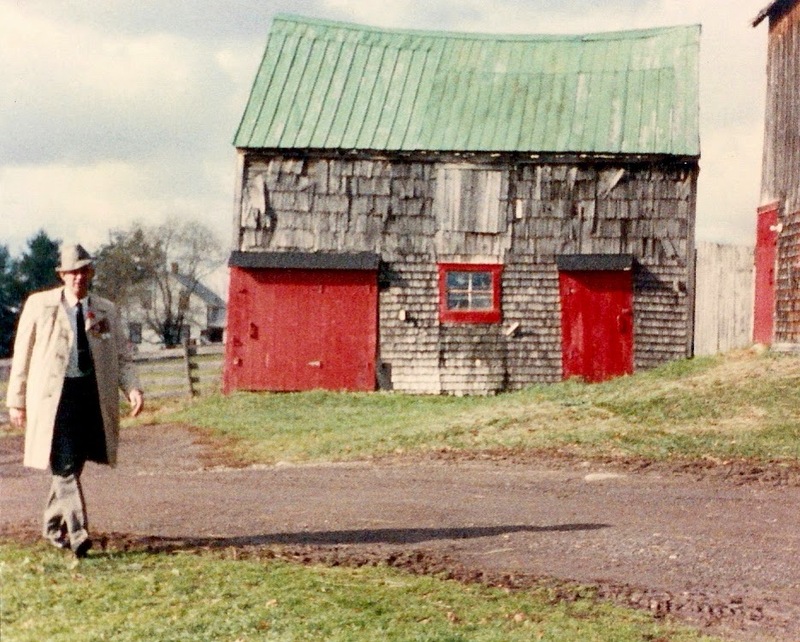 My stepfather returning home after marching in the Remembrance Day services that year. Still hale and hearty, still wearing his hat at a rakish angle. For many years on November 11, I stood in the darkened gym at John McCrae and smiled proudly, and wiped away a tear or two, as the students read and performed their work to a hushed crowd of students and staff, some parents, and even a few veterans. At John McCrae, we remembered. And, well, this year, I wasn’t much interested in attending a big ceremony. I was thinking my own thoughts. Of that beach so far away from home and the girl in her flip flops playing the bugle. And remembering. Your post and the music brought tears to my eyes. Thank you for that. Very moving and so glad to know this is celebrated in some form in so many places. Great post, Susan. WWI was so very devastating and I'm glad it's getting more attention this year. I feel in the US it is not talked about very much, the media continues to focus on WWII and, to some extent, the Vietnam War. The Tower of London display is stunning and I love seeing pictures of it. Thanks so much Jill. For your comments and for the "feature." Very much appreciated. We share the same first name – and memories of Remembrance day in more than one country. I wrote a post about my November memories as well. . . but it was yours that brought tears to my eyes. How hard it must have been for you to receive the news about your father. I'm following your blog now. Thanks for the kind words, Susan. And thanks for reading…and following. Thanks for sharing this with the Thursday Blog Hop, Susan…you taught me things I did not know today…and I love that! Thanks Pam…just what every teacher wants to hear. Thanks for hosting the Blog Hop.